OUR STORY: When I first started my company, I wanted to achieve excellence. I worked SO HARD to develop the perfect system for helping my clients and making money. Now I'm here to help YOU find success faster and easier with all kinds of carpet cleaning tools, guides, and videos. George is an extremely successful carpet cleaning business owner that serves over 3,000 clients, most of whom are repeat customers. He is, of course, IICRC certified, but went over the top to achieve almost all of the certifications that a carpet cleaner can attain. Faced with the challenges of building a successful business with limited guidance, George endeavors to help others achieve similar success. He has taken his extensive knowledge and found his way on to multiple television programs, has this popular DVD series, an AOL hosted Videos AOL Hosted Video and has many popular videos on You Tube. 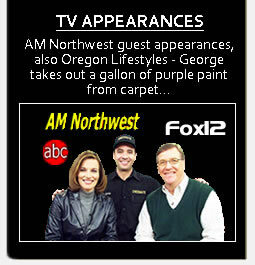 He has appeared on AM Northwest on ABC, Oregon Lifestyles on Fox 12, KEPX Radio, Around the House with Bill Rooney, and is continually in involved in public speaking events. George has also invented a tool called Perfect Patch to make patching carpets simple for everyone. Here are several sample carpet cleaning training videos.Our hope and wish is to see you be as successful as possible! For the most information and education, check out our products page. 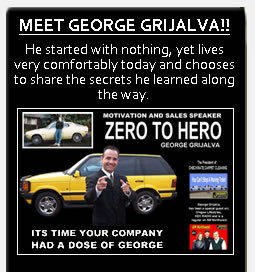 *** March 2009 UPDATE: After forging multiple ground breaking, industry-changing partnerships, George is now touring the country sponsored by PROCHEM, delivering LOCAL TO YOU, high impact carpet cleaning sales training and motivational seminars. It all began for me in the 80's. Life was great until my mom and dad started Checkmate Janitorial, "the company that defeats all others". That is when my life became a living nightmare. When I was fifteen, my parents woke me up at 5:00am each morning, before school, so I could clean toilets and mop floors. Not only that but I also I had to work after school and often times in the middle of the night. So much for having a life! Just when I thought it couldn't get any worse my mom came home with a big blue box. She informed me that this wonderful machine was for carpet cleaning. After paying $500 for this hunk of junk she was very motivated to schedule me for even more work. I wanted to change places with anyone in the world at that moment. My nightmare lasted five years. When we left southern California to move to Oregon, we left Checkmate Janitorial behind forever...or so I thought. Thirteen years later, I came home from work as a StockBroker recruiter (I loved that title it sounds so cool and important). As I came through the door, my wife couldn't wait to tell me all about our new neighbor who has a carpet cleaning business and makes a lot of money. She was talking to him about starting a business in the service industry and they thought a blind cleaning business might be just the ticket. Thank God, I thought she was going to try to talk to me about carpet cleaning. "Let's meet John at the cleaning supply company tomorrow and we can get some more information." she said and I reluctantly agreed. At the meeting John talked about blind cleaning and I listened, but then the conversation took a 360 turn towards a truck mounted carpet cleaning system. By the end of the conversation he somehow managed to make carpet cleaning look like it could possibly be a good business for us. Next thing I knew I had a truck mounted carpet cleaning van in my driveway and NO customers. Two weeks later l lost my job. I took it as a sign that God must want me to start moving forward on building a carpet cleaning business. Against my will my wife dragged me to a free seminar we got with our truck mount put on by Howard Partridge. I was captivated by his success cleaning carpets. I soon took every IICRC course that was available. I became a carpet cleaning information addict. Our first month, with my wife in the home office, we made $8,000.00, I couldn't believe it. Second month we made $12,000.00 and we were flown out all expenses paid to speak at a Howard Partridge Round Table Seminar. That first year we made over $107,000.00 and the kicker is, I only worked Monday through Thursday. Success is so much more than money and our family time is high on the priority list. I know that a four day work week sounds unbelievable to some but I knew that God was blessing our business and He has proved that he is more than capable of doing that even in only four days a week. Eight years later we have three thousand residential customers, four Prochem truck mounted vans, one estimating vehicle, a corporate office, three Checkmate locations (Vancouver, Washington & Beaverton and Clackamas, Oregon) and we have a sister company CarpetCleaningTradeSecrets.com. We are recommended by over 40 carpet stores, real estate agents, interior designers, builders, Street of Dreams & Parade of Homes. I have been invited to be on over twelve TV shows at no charge, four radio shows. We are a great example of American Entrepreneurial success, that can be yours as well. We want to help anyone who wants to help themselves take their Carpet Cleaning business to the next level. Our Carpet Cleaning Training Video series was created to give you the hands-on knowledge to achieve mastery levels of expertise in your industry. Each video uniquely addresses issues that you encounter every day in your business, and teaches you to handle them, while guiding you to greater sales and more referrals.